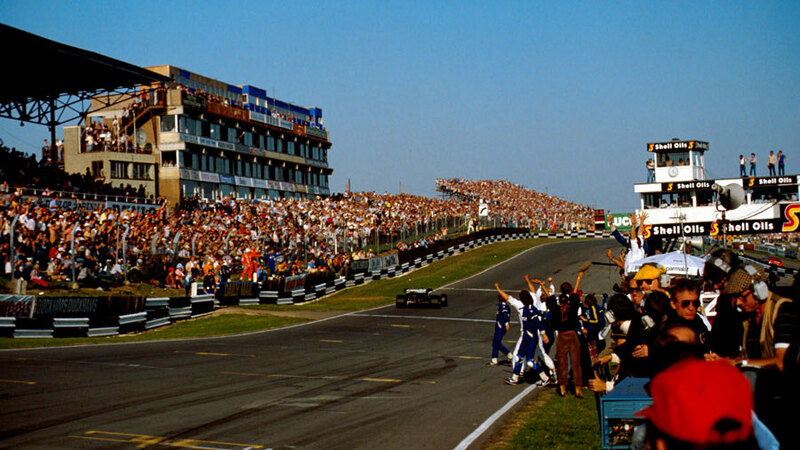 Nelson Piquet moved to within two points of championship leader Alain Prost with victory at the European Grand Prix at Brands Hatch. It was the second Formula One grand prix of the year at the circuit - Keke Rosberg had won the non-championship Race of Champions in April. And for the first time spectators were able to follow the action on a giant 20ft x 30ft screen in front of the grandstand. The race had been added to the calendar in June after organisers of a proposed grand prix at Flushing Meadow Park in New York had asked for a postponement after failing to raise sponsorship and strong opposition from environmental groups. Although Bernie Ecclestone and NY mayor Ed Koch agreed the event would happen in 1984, it was quietly dropped. Four drivers were in with a real chance of the title going in to the penultimate weekend of the season with Ferrari's Patrick Tambay and Rene Arnoux right behind Prost and Piquet. But the first three places on the grid were taken by the Lotuses of Nigel Mansell and Elio de Angelis and Riccardo Patrese's Brabham. Eddie Cheever in a Renault produced another demon getaway from the fourth row but de Angelis led from pole although he was soon passed by Patrese. Mansell, meanwhile, dropped back to seventh as he struggled to get even heat in his tyres. As de Angelis tried to pass Patrese their cars collided; Patrese only lost one place after spinning but de Angelis retired two laps later with a blown engine. As Piquet and Prost moved clear, behind them there were all kinds of hijinks. A spin for Arnoux left him back in 15th and he was only able to climb up to ninth, leaving his title hopes hanging by a thread, although Tambay's ended when he spun off after losing his brakes at Druids. Derek Warwick, who a week earlier had won a 1000km race at the same circuit, did well to continue after his in-cockpit fire extinguisher went off when in the top four. "The fluid kept pouring out for more than a lap and it was rather like frostbite," he explained. "My gear-changing hand simply froze solid and I had to work hard to get some feeling back into it." He recovered to finish fifth ahead of team-mate Bruno Giacomelli to give the Candy Toleman its first double point-scoring weekend. Piquet finished six-and-a-half seconds ahead of Prost with Mansell third. "The car was fantastic," Piquet said, before warning that he was concerned the track in South Africa, the venue for the final race of the season, "might not suit me". On his F1 debut Jonathan Palmer came 13th in his Saudia Williams despite losing all but the last layer of his tear-off visor on the first lap. He admitted that for the last third of the race his visibility was so limited he had to slow when approached by another car.